J.G. 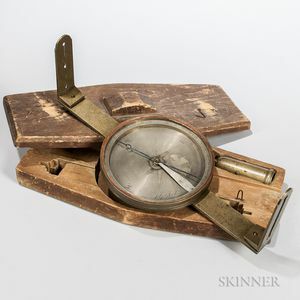 Dod Surveyor's Compass, Newark, New Jersey, 19th century, 5-in. silvered engraved dial marked "J.G. Dod Newark," blued-steel needle with internal lifter located on the interior of the tripod mount, screw-mount sights, and housed in the original fitted pine case, lg. 14 in.